Alec is one of those kids who loves to read more than he loves school. It is his solace and refuge, and on the very first day of school, he is sent to the principal's office for reading instead of doing his work in art class. The principal informs him that if he doesn't mend his ways and do better in his classes, she will recommend him for a summer program for study skills. Not wanting to spend six weeks of his summer back in school, Alec does try to pay attention, but there's the problem of after school as well. Both of his parents have gone back to work, and Alec and his brother Luke have to spend three hours in an after school program. At first, this seems like a great idea. Alec will just read quietly in a corner. That's not good enough for the program director, who informs him he will have to do his homework in the designated center, join in Active Games, or join a club. After some problems with his former friends David and Kent, Alec decides to create his own club and try to limit it to people who want to sit and read quietly. He finds another member, Nina, and is secretly pleased that he can talk to a girl and have her seem interested, but there is someone else who would like Nina's attention-- Kent. Kent is a great athlete who enjoys making fun of Alec, and he undermines the Loser's Club as much as he can. Eventually, though, the three actually discuss the problems that they are having with each other and come to a tenuous understanding. The Loser's Club continues to grow, and even Alec realizes that while reading is a great thing to do, it's not the only way he wants to spend his time. Clements is the undisputed master of the school story, but this book also made me realize that there is a delightful new trend in middle grade literature. More and more, we are seeing children who are having trouble relating to friends, talking to the other gender, struggling in school, or trying to work their way through typical middle school problems... and they have support and actually do the right thing! Is this circling back to the 1950s, when all of the children were models of good behavior? Not at all. Alec isn't perfect. He promises his parents he will bring his grades up, but after a while, they drop. He is mean to a boy who wants to join the club, but when Nina calls him on it, he apologizes! The fantastic thing about this is that children really do look to books for clues on how they should act. It's hard to know how to handle certain situations, but if they can see positive examples in literature, it's bound to help. Kent and Alec's relationship is extremely well portrayed. Kent is a stereotypical bully in some ways, but in many ways, he's not. He usually only gives Alec a hard time when his friends are around, but when he sees Alec doing fairly well in dodge ball, he actually encourages him to explore sports some more. Alec wins a bet and makes Kent read a book, but he makes the effort to go to the school librarian for recommendations of books that Kent might like. This is how teachers and parents hope that children will act. It's delightful to see. Clements excels at writing is a short, succinctly written book, with a certain suspenseful feel to it. What will happen with Alec and Nina? Will the group be able to make a Parents' Night presentation? Will Alec be able to keep his grades up? This will keep readers turning the pages, and along the way they will encounter a list of books that the characters like that they might be interested in picking up after they have finished The Loser's Club. Unless they need to immediately reread it for comfort! I'm going to "force" one of my fantasy-book-a-day readers to finish this one. I don't like dictating student choice, but if a teacher requires a mystery, it can be a SPORTS mystery, etc. I love the phrase "one series to rule them all rut"! Thanks for your review of this book. Andrew Clements has always been one of my favorite authors but I've fallen behind on his new material. I will definitely check this one out when it releases next month. Clements hooked me with FRINDLE and I haven't stopped reading his books since. This one sounds perfect and I too like the trend. My oldest granddaughter is now reading at a level that I can recommend books like this one, and all Clements books are worth a look. Thanks, Karen. YES! As an introverted child who was never a "joiner", Alec sounds like a character I would've adored. I also really appreciate books that showcase kids dealing with the kinds of everyday problems that might not seem like a big deal to adults (or literary awards committees....), but which can actually seem pretty serious to kids. There is absolutely a need for books about kids with terminal illnesses, or drug addicted siblings, or abusive parents, but sometimes just dealing with a mean classmate or an annoying sibling can be enough stress for a kid to deal with! 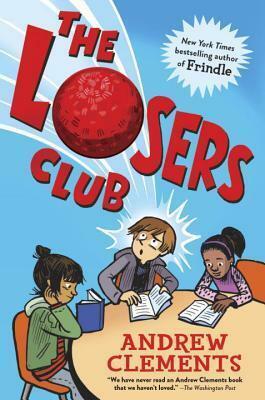 Andrew Clements can do no wrong as far as my sixth graders are concerned - thanks for sharing this new to me title. This book sounds really, really good! I definitely have to try it. Thanks for the review! I am reading this one right now. I think this is my favorite of his since Frindle.